I had my annual visit to the dentist today. It's frankly a bit of a pantomime as, in the 14 years since I moved to the other side of town, I've never bothered to shift my dentist from the far reaches of North Nottingham, well up Derby way. Well, they're nice enough, it's only once a year, it's not that far from my office and NHS dentists are pretty hard to find, so.... It was also a cold enough day that I was also able to appreciate having my backside parked on a heated seat instead of perched on a bike saddle. I don't really like going to the dentist. This has got worse as I've got older and my dentists have got younger. I had loads of orthodontic work done as a kid: extractions, massive braces, headgear and elastic bands at night... the works. Never really bothered me. I had a pretty unpleasant experience when I had my wisdom teeth taken out under local anaesthetic when I was a student, but that didn't really knock me off my stride. It's not as though I've had loads of problems with my teeth, either... because I haven't. I do have one or two fillings, but for the last fifteen years, I've not really needed anything much doing at all.... and yet at some point in that time, I began to dislike going to the dentist. I was reading a book to my niece the other day before she went to bed; it was a nice book, but at one point there was a picture of the grandmother in bed with her teeth next to her, in a jar of water on the bedside table. My niece was a bit freaked out: apparently this is totally beyond her experience and she has no reference points to understand false teeth... which were a pretty common thing for my grandparent's generation. My niece, it seems, is growing up in a world where even the English have decent teeth. "Your teeth are looking really good and you should be good until we next see you in about a year. At least a year." 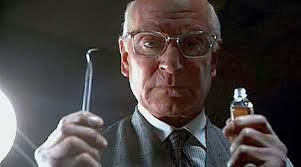 "You've got a some micro-cracks in a few of your teeth. It's pretty much unavoidable if you have any fillings at all and pretty normal at your age... but you might find that one may open up at some point, or a bit of tooth may fall out." "You also look as though you might be a bit of a tooth-grinder. I can see the dentine starting to come through on the tops off your bottom teeth. They should be fine for now, but you may get some sensitivity and at some point you might need to have some white filling put into them to provide some protection. They really do look good though. Well done." Why couldn't he just leave me with the good news? I don't need anything doing, but I still left feeling as though I was about 150 years old with teeth from the 1870s.